The first national audit of intermediate care in England, published in September 2012, highlighted the need for more intermediate care services. In the UK, the term ‘intermediate care’ describes a layer of care between primary and specialist services that is intended to prevent unnecessary hospital admission, support early discharge and reduce the need for long-term residential care. Intermediate care requires effective interprofessional working across health and social care. Interprofessional education is believed to help the different professions work together successfully, however, there is little information in the literature about what should be taught and how. 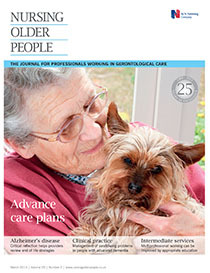 This article discusses a study day, which was designed as part of a research project into the development of interprofessional working in intermediate care. It includes an overview of the literature, a detailed description of the educational content and process, and participants’ responses to that content and process. This helped to identify the characteristics of successful interprofessional education so that others can use them.